Today’s collection of WordPress themes is dedicated to kids and toddlers oriented organizations, educational insitutions and establishments. You can take these designs to create websites for nurseries, kindergartens, day care centers, pre-schools, play schools, colleges, and even kids online stores. 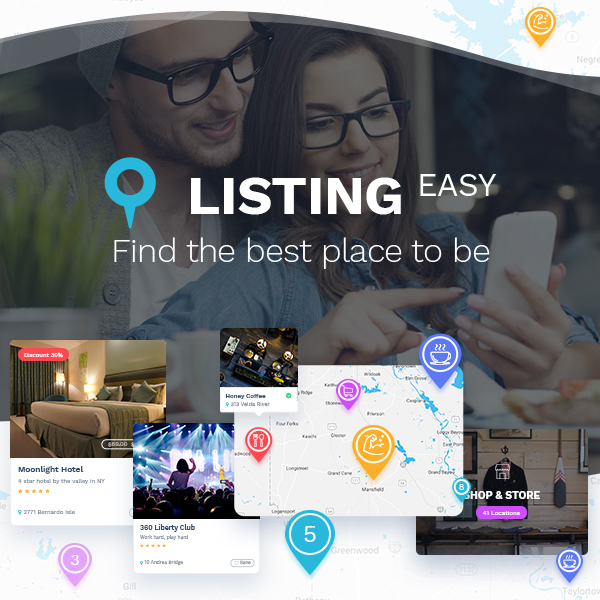 We’ve hand picked the newest templates with the most comprehensive list of features, so check them out! 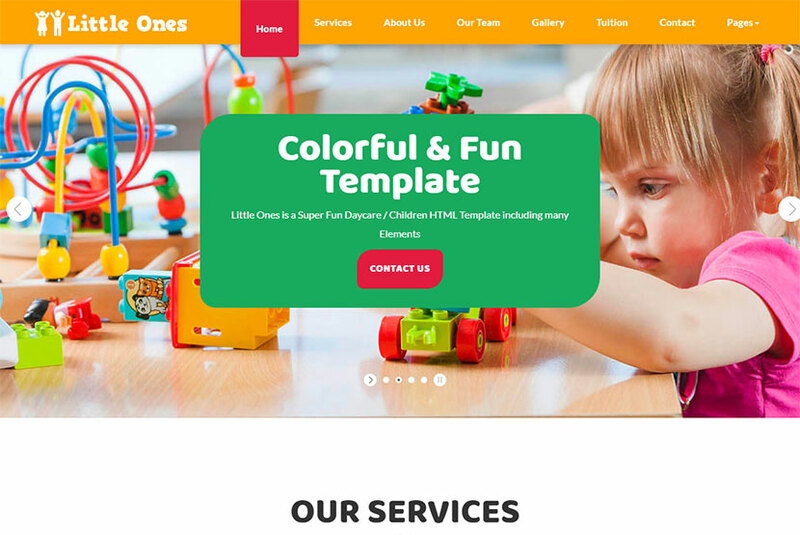 A niche-specific WordPress theme specially created for kindergarten, preschool nursery, day care and any other establishment for toddlers and older children. It is also quite suitable for children groups, play schools, kindergartens and kids stores. The template comes integrated with Timetable plugin which allows to display the schedule of classes and any other activities. As the theme is also compatible with WooCommerce, it provides you with the possibility to transform your website into an online store and sell products for kids. Check out more of the theme’s features and take it for your project now. 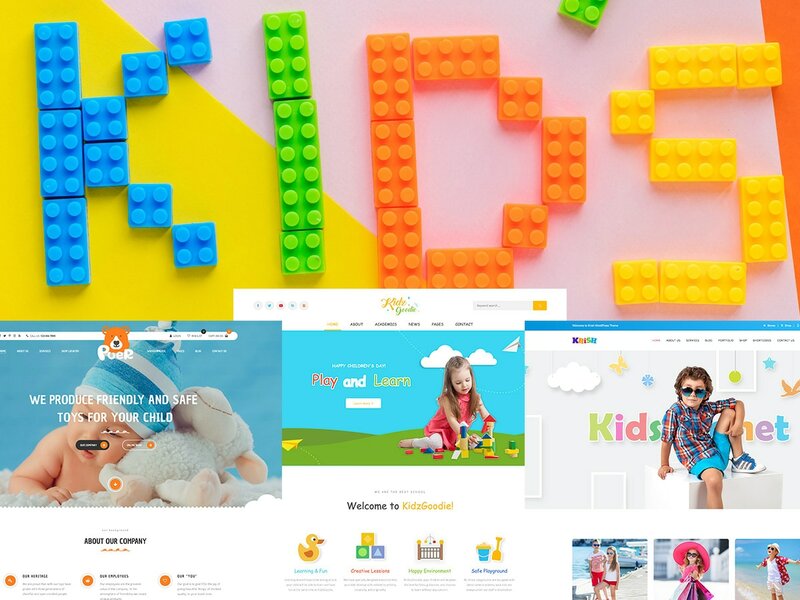 A cute and trendy WordPress theme which is fully integrated with WooCommerce and allows to create a full-fledged online store for children. It comes with two homepage layouts available either for creating a toys shop or a parties and gadgets store. The template is built with WPBakery page builder, so you can edit every element using the drag-and-drop interface. It supports Snazzy Maps solution for customizable maps, WooCommerce functionality for creating an online store, default WordPress blog with all post types, Contact Form 7, Revolution Slider included, Custom shortcodes, and many more features. 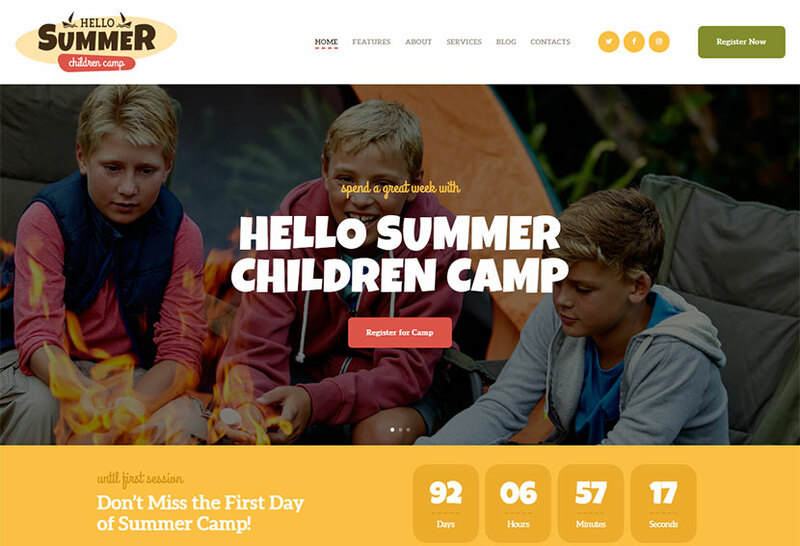 A WordPress theme built for summer camps for children or a kids activity center. It will be perfect for campers, packing instructions, hiking, kid events, parenting blog, child sports, and more related organizations. The template is compatible with premium plugins like WPBakery Page Builder, Revolution Slider, Essential Grid, Booked Appointments, and more. So your visitors can book appointments online, browse your beautiful galleries and find out more of your organization presented in an engaging manner. Use the drag-and-drop page builder integrated into the theme to easily create a website without a single line of code. A great WordPress WooCommerce theme which comes with minimalist design and unlimited layout options helpful for creating a comprehensive online store for selling kids clothes, adult clothes, and any other products. The features of the theme are numerous and really helpful for easy website creation. They include WPML support, Customizer options, unlimited colors and Google fonts, Wishlists, Ajax shopping cart, Product Quick View, products carousel, latest posts carousel, grid view and list view for shop page, multiple blog layouts for your choice, and many more opportunities. An awesome WordPress theme which will become an extensive design solution for a children oriented website. The template is meant for preschool and kindergarten related websites or any other similar educational institutions. 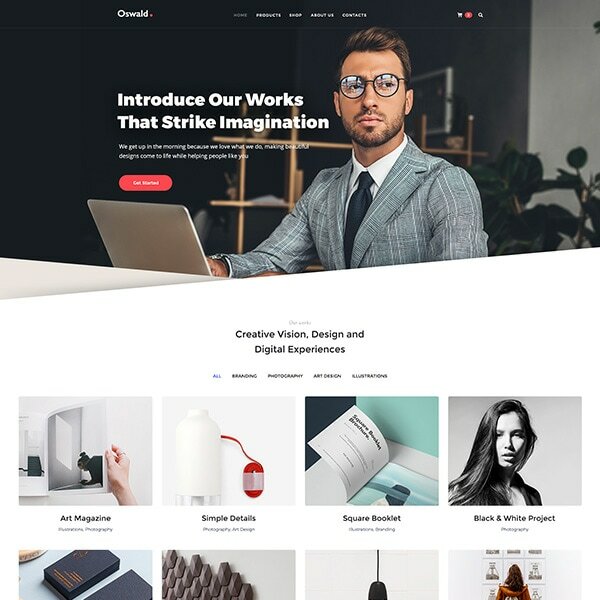 It comes with 3+ homepage unique layouts designs, multiple header styles, different posts formats, different portfolio grid columns, WooCommerce shop, newsletter subscription box, parallax image and video scrolling sections, WPBakery page builder and Revolution Slider integrated, WPML support, and many more features. A WordPress theme designed for kindergarten, preschool, primary school or elementary school, junior high school, college, child care center, nursery or nanny agency. 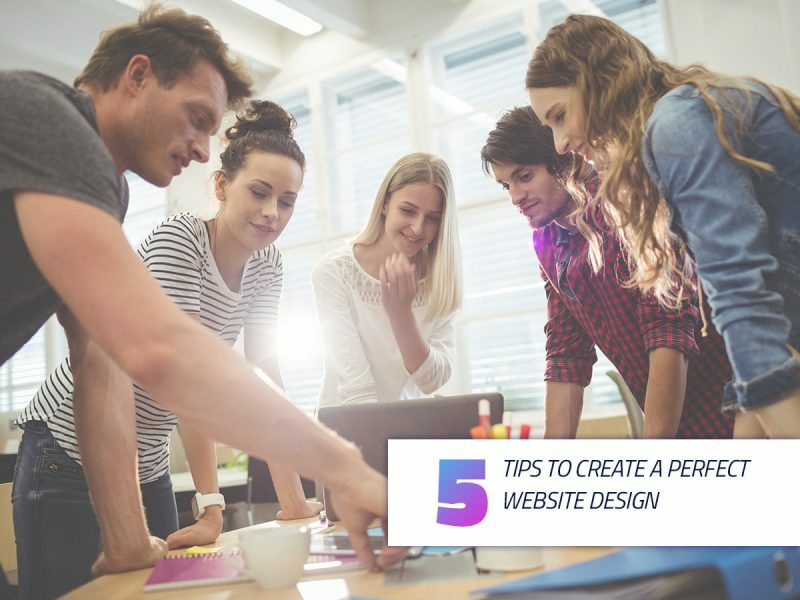 The template includes a host of useful features which will transform a website building process into a piece of cake. WooCommerce support, visual page builder, preloader and minimal CSS animations, WPML compatibility, Event Calendar and Event Calendar Pro supported, 3 homepage layouts, Slider Revolution, sticky headers, and many more features are just a small part of all its possibilities. A WordPress theme craftily designed for kindergartens, daycare centers, nurseries and primary schools. The developers have created this theme to meet the needs of children oriented niche sites. The theme is coded with HTML5 and CSS3 and comes integrated with Kirki Customizer which provides it with a variety of options for changing the look and feel of your web-pages. More of its features include 9 portfolio types, 5 different blog types, gradient color options, powerful backend options, unlimited page layouts, 11 header types, and more features available. 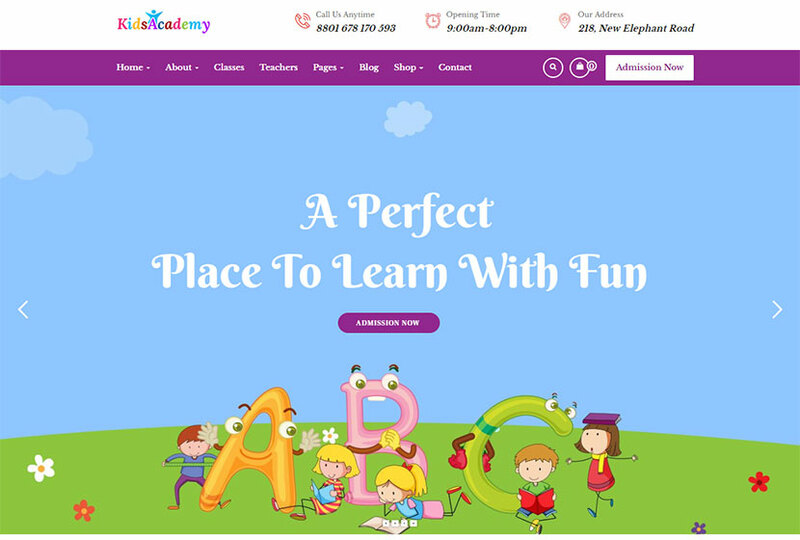 A professional WordPress theme suitable for preschool, primary & elementary schools, kindergartens, child care centers, nurseries, early education school and other kids oriented websites. The theme’s features include an extensive admin interface, lots of custom shortcodes, custom and customized WPBakery page builder components, bottom footer widgets, custom page templates, pixel perfect design, unlimited pages, various post types, WPML & translation ready support, multiple header options, and more. 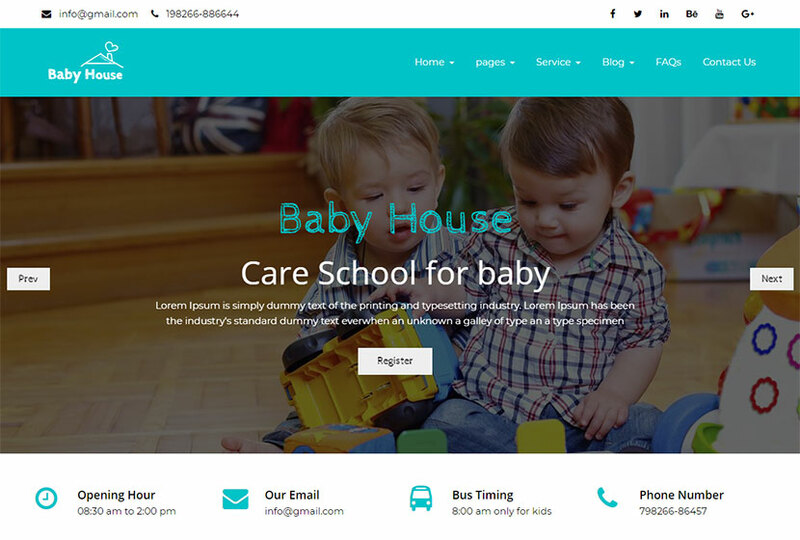 A one-page WordPress theme made for any children and daycare related websites. Kids summer camp, kindergarten, nursery school, pre-school, and any other organization can take this theme for creating their online presence. The template is built on Bootstrap framework which has powerful options that make the template completely customizable. It also Includes 4 readymade color skins, Redux framework options, WPBakery page builder, MailChimp support, Magnific support, boxed and fullwidth layouts, Isotope filterable gallery, and many more features available. A multipurpose WordPress theme made by professional and creative developers to match the needs of kindergartens, schools, play schools and other educational institutions. Powerful Redux framework used for theme options, SiteOrigin page builder, fullscreen background slider, drag-and-drop admin page layout, contact forms with Contact Form 7 support, MailChimp compatibility, 2 theme layouts with easy switch, unlimited color options, sticky header, unlimited pages, pixel perfect design, and many more features are included. A colorful WordPress theme for kindergarten and preschool websites. Feature-rich and versatile, this template makes website creation process simple and fast. It comes with Live WP Customizer and King Composer drag-and-drop page builder which make editing and customization an easy task. Revolution Slider is integrated into the theme to create awesome presentations and introduce your organization, its achievements and services. Advanced typography options, WPML support, and many more features are also included in the pack. It’s easy to make all the kids in the world happy! Give them the best education and exciting life. Promote your child care institution with ease.